As the TMNT and Ninjara workout, they’re interrupted by the future versions of Donatello and Raphael, who have come to their past to take the Turtles and Master Splinter to the future. In the future, Armaggon arrives at his headquarters with an unconscious Merdude as his prisoner. Shredder and Verminator X explain that they were unable to procure the Black Stone of Mecca (TMNT Adventures #35), which sets Armaggon into a rage that Shredder does not appreciate and a fight seems imminent. Before any blood is shed, Verminator X holds the two at bay with a gun and explains that while they had failed to get the Black Stone that they were going to use to power their time machine, they did manage to steal the White Stone. 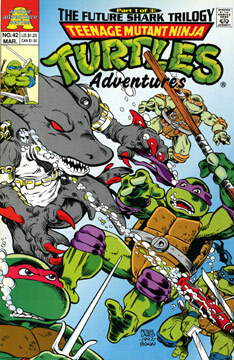 The future Turtles bring the present day TMNT, Ninjara and Splinter to their time. As soon as they arrive through the time portal, they’re attacked by flying robots – just as it looks like curtains for our heroes, the ‘bots explode. Future Don explains that the machines are his security robots and shouldn’t have attacked, but they were apparently confused by the appearance of two Dons and Raphs, so he hit the self-destruct button on his remote control. Future Don then escorts the group into the lavish future headquarters of the TMNT. Future Raph explains that their building was invaded by Armaggon, who was messing with Future Don’s Time-Slip Generator. Future Don shut down the machine before Armaggon was able to transport, but the shark man managed to escape through a window and into the flooded streets below. The Future Turtles gave chase and caught Armaggon, but as they were beating him into submission, Shredder and Verminator X arrived and blasted our heroes with a laser, knocking them unconscious. While the Future TMNT were down, Armaggon then shot them with a torpedo. Eventually Future Don and Raph woke up – to find Leo and Mike missing and Raph’s left eye gone… not to mention, the villains had stolen the Time-Slip Generator!